MisteR’s shoe range is part of a collaboration with fellow ChCh firm Commando-M, an iconic shoemaker that popularised Kiwi-made kicks back in the 1980’s. The best bits of the MisteR ethos make up the body pattern, with dark and lighter options available for just under $2-hundy! 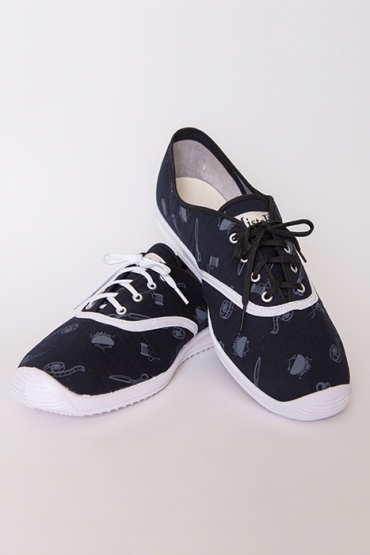 In true MisteR form, these shoes are unisex and New Zealand-made. The best way to get your hands on a pair is by shopping on MisteR’s online store. This entry was posted in Fashion & Style and tagged aw13, Christchurch, designer shoes, dynamic duo mister, menswear, Mister menswear, mister raven riddler shoes, mister shoes, New Zealand, new zealand made. Bookmark the permalink.